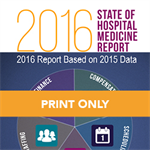 The Society of Hospital Medicine's (SHM) State of Hospital Medicine Report - the most in-depth, comprehensive survey of hospital medicine in the country. 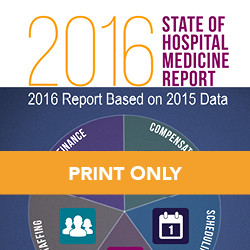 The Report provides current data on hospitalist compensation and production, in addition to cutting-edge knowledge covering practice demographics, staffing levels, turnover, staff growth, compensation methods and financial support for solid, evidence-based management decisions. This is the print version.